Have you ever found yourself constantly asking, “Why am I not good enough?” Feeling incredibly bogged down with self-doubt, and left wondering why you don’t receive the love from others that you crave. Sara Matt struggled with this very issue. She thought that if she gave gifts to the people in her life, she could buy affection and hopefully receive the love she wanted in return. Sara learned the hard way that that’s not how personal relationships work — she had to work to accept herself before she could make progress in other areas of her life. If you, like Sara, are struggling to learn how to feel good enough, you’re not alone. It can be painful to admit that you’re suffering from insecurities, but there are tools and resources to help you work past these obstacles. 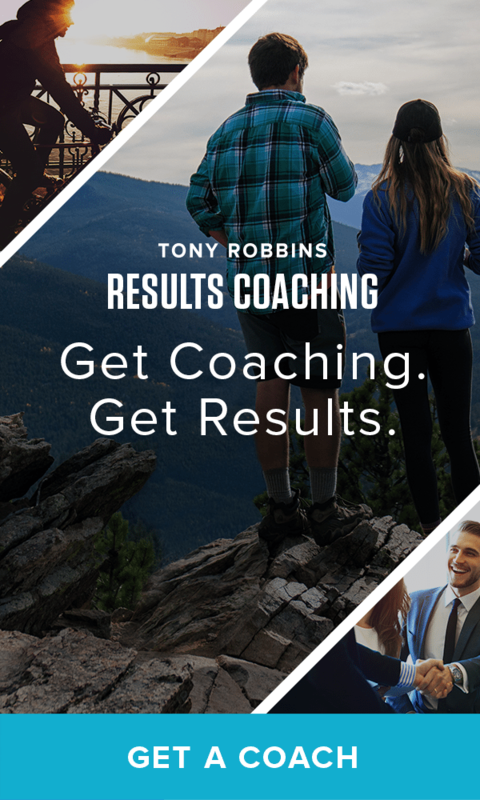 Tony Robbins Results Coaching was designed to help you reach the objectives that will better your life and help you advance in the areas you feel are lacking. Watch the video below to see how Results Coaching helped her transform from not enough to an extraordinary life filled with love and success. Believing that you’re not good enough has you living in a constant state of anxiety. But what are you afraid of? A Results Coach will help you to pinpoint the reason why you’re feeling insecure. Most likely, you’re afraid of not reaching your full potential. When you put off making progress toward your goals, you start existing in a perpetual state of anxiety. This makes you think that obstacles are bigger than they actually are, and causes you to doubt yourself. A well-trained Results Coach can help you identify the limiting beliefs standing in your way. Why did you start believing you’re not good enough? Was it because you failed at a task in the past, or because someone told you you were incapable? Once you can identify the reason why you’re afraid to grow, then you can begin to make progress. It’s one thing to tell yourself repeatedly that you’re not living up to your potential — it’s another thing to do something about it. You have to find the drive within yourself that will propel you to succeed, and a Results Coach is there to help you along the way. Your loved ones want to support you in your endeavors, but they won’t always be able to provide you with the open feedback that a coach will. That being said, a coach will not dictate the exact steps you need to take to achieve your goal. Instead, they’ll help you identify clear objectives and ask you if you’re making the right moves to follow through with your goals. A Results Coach will never push you to do things you’re uncomfortable with; they’ll just remind you of your values, call you out when you’re slipping up and help point you in the right direction if you’re feeling lost along the way. Think of all the time you’ve spent telling yourself you’re not good enough. What could you have accomplished if you put that time to good use instead? A Results Coach will help you to not only identify your ultimate goals, but to limit your distractions. If you say you want to work on getting in better shape, but insist you don’t have time to regularly go to the gym, a Results Coach can help you identify gaps in your schedule where you’re mismanaging time. A coach can help you see that if you want something badly enough, and have the hunger to go after it, you can achieve anything. The excuses you’ve made up for yourself are merely a way to avoid putting in the work. A coach will never tell you what you should or shouldn’t do with your life, but once you’ve identified your goals, they will help you create an actionable plan to help you reach them. Your chosen coach has already reached success in his or her own life, and undergoes 250 hours of annual training to remain up-to-date on the best strategies to help you succeed. During your time with your coach, they’ll create an extraordinary plan that helps you achieve the incredible results you’ve been envisioning, but have been too afraid to chase after on your own. The minute you stop telling yourself “I am not enough,” your life will change for the better. As Tony Robbins says, “Whatever you hold in your mind on a consistent basis is exactly what you will experience in your life.” Not everyone has the knowledge to change their story on their own, and that’s nothing to be embarrassed about. Working with someone who has the knowledge you need, like a Tony Robbins Results Coach, will help you build confidence in your skills, which will ultimately make you feel empowered to go after the success you know you’re capable of. To start accepting that you are more than enough and begin living your life at the next level, schedule your free 30-minute coaching strategy session today.